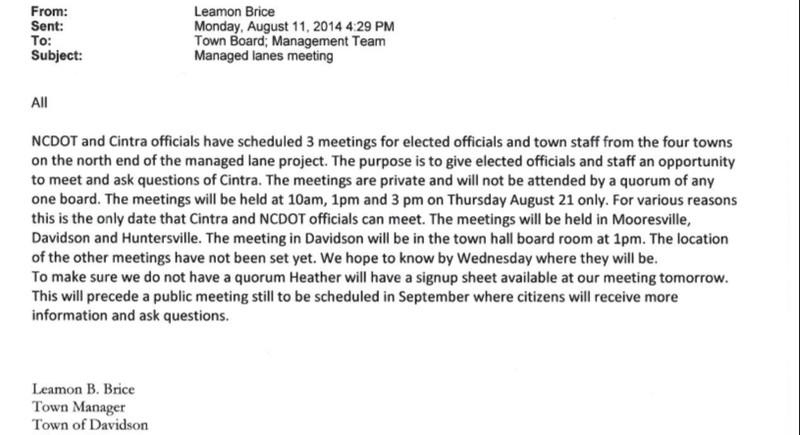 Mushroom Alert Part II: Who exactly wanted last week's Town/Cintra/NCDOT meets to be closed? The "Mushroom Alert" post sparked enough interest to warrant looking into this question. 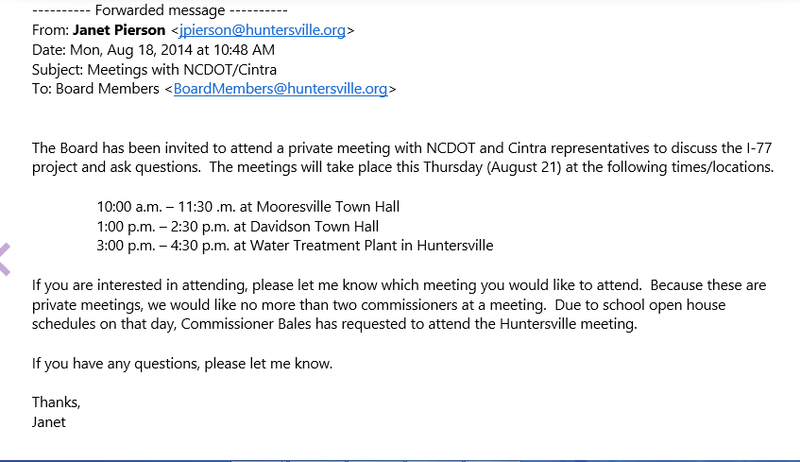 Who exactly wanted to keep the wraps on last week's meetings with tolling firm Cintra - the LKN Towns or NCDOT? As expected, what we found was not pretty. The public record made available though various records requests, shows a concerted effort by many parties to deliberately structure these meetings in a way that would keep the public and the press out. Even more disturbingly, it shows a business as usual attitude about conducting the public's business this way. In the end it hardly matters who originally wanted these meetings to remain closed. Once the process was set in motion, nearly everyone involved was comfortable with it. The Mooresville and Davidson invites make it crystal clear that coordinating the meetings to ensure no board has a quorum at any one meeting is the purpose for having three meetings and the method by which they will all remain closed. This ensures none of the elected bodies runs afoul of the state's open meetings law. There are also a number of emails that show significant effort put into ensuring it remains that way. So, who wanted these meetings closed? The answer appears to be just about everybody. This is the earliest email in all of the public records provided - a week before the invites went out. It copies all of the town mayors, and it seems pretty clear they are excited about having these non-quorum meetings on the topic so they can get some coaching on how to deal with the pesky public. So there you have it. This type of thing is just business as usual. Nothing at all to be concerned about. Maybe it's not obvious to some, but there would seem to be a difference in the spirit of attending an open meeting organized by a citizens group such as WidenI77.org and the spirit of attending a carefully organized closed meeting attended only by public officials and the company being paid to build a road most in the community oppose. 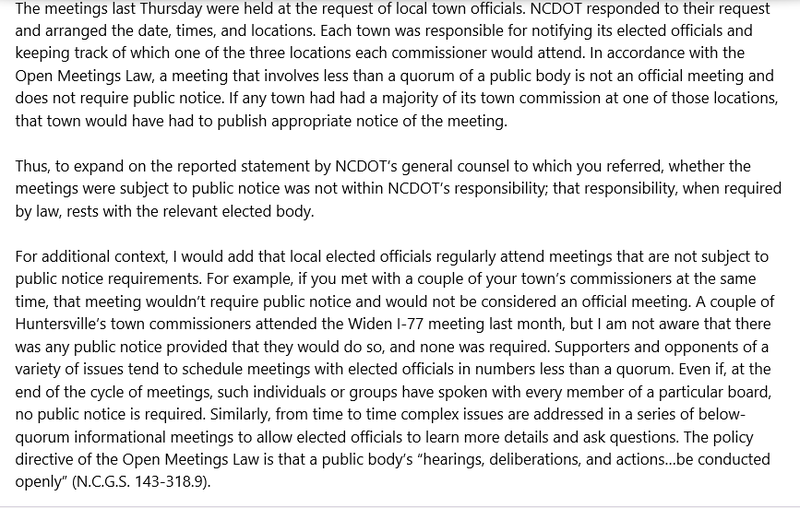 Finally, for a good laugh check out the massive amount of chutzpa in the NCDOT news release regarding last Thursday's meetings. After all the effort to keep these meetings closed and out of the public eye, NCDOT posted the below news release only a few hours after word had leaked they were going to occur. "Collaborative and transparent" is not how too many average citizens would describe this process. It's the Huns! It's the Mongol Horde!!! Oh, wait. It's just WidenI77.org. The last post ended with a reference to how this whole HOT lanes situation is beginning to take on the trappings of a Shakespearean tragedy, but little did we know that the act would continue so soon. Davidson Mayor John Woods possesses a flair for the melodramatic, and once again he delivers. 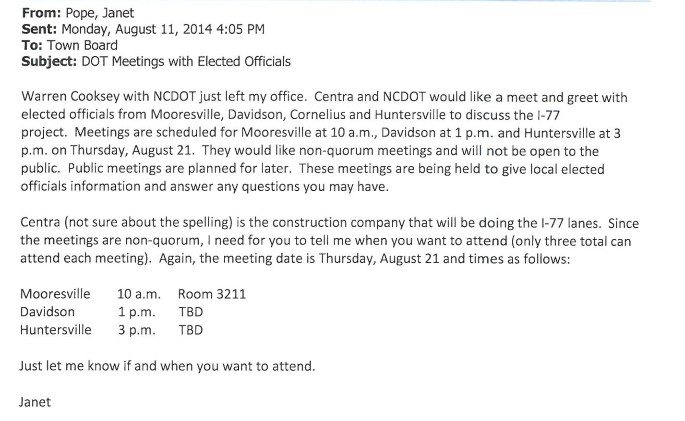 The below gem surfaced during our investigation of who exactly requested last week's closed meetings with NCDOT and Spanish tolling firm, Cintra. "Invade!" Really??? Is that what people are doing when they show up to participate in their government? One would think Atilla the Hun or Ghengis Khan was about to roll into town rather than a few fed up citizens. In this email, Mayor Woods is referring to last Monday's visit to Davidson Town Hall by Mecklenburg BOCC Chair Trevor Fuller for a meeting that was open to the public. As such, it was a highly stagemanaged affair where Commissioner Fuller dodged any and all HOT lanes questions by claiming ignorance on the subject. NCDOT's Warren Cooksey was also on hand that night. He did not participate but could have served as a good backup to Comm Fuller - just in case some "invaders" (aka citizens) got out of hand and asked some really hard questions of the top county official. Fortunately, the invaders were well behaved. Folks, Mayor Woods's email and last Monday's session with BOCC Chair Fuller are prime examples of the "Us vs. Them" mentality of too many of our top elected officials. The "Us" being the establishment ruling class, and the "Them" being the rest of us. If you disagree with certain elected officials, you are labeled as an invader. If you ask hard questions, you will get subterfuge and stonewalling for the effort. If you stand up for what you believe is right, you will be smeared. This is what the public faces day in and day out from our halls of power. To be fair, not all of our elected officials act this way. Commissioner Rob Kidwell from Huntersville exposed the planned closed meetings last week on the HOT lanes. Commissioner Dave Gilroy from Cornelius regularly asks hardball questions on important issues. However, silence is acceptance from most. We need many more elected officials to step up and call out this type of behaviour when it occurs. For elected officials to treat citizens this way is plain and simple bullying, and it needs to stop. Yesterday was a big day for aShortChronicle, and it was particularly satisfying that it happened around such an important issue as government transparency. The site hit an all time record in daily page views, and the Mushroom Alert post on the "closed" HOT Lanes meetings with local officials became the fastest rising post in the site's history. A good bit of that had to do with the post being linked at CarolinaPlottHound.com - the Drudge-Report-styled aggregation site focusing on the Carolinas. However, we also received a big bump locally driven by Facebook. A good bit of the regular readership of this site is made up of local activists, elected officials, and staff members. There are also a few media types mixed in based on feedback we've received. For many of the elected officials and the more mainstream media, it's probably like witnessing a car crash. They don't want to look, but they can't avert their eyes. All of that is to say we don't know if this site played any role in yesterday's opening up of private meetings on public affairs, but we'll take yesterday's readership as a sign the public is truly interested in knowing about these types of shenanigans. To that end, we'll be staying on top of this story. 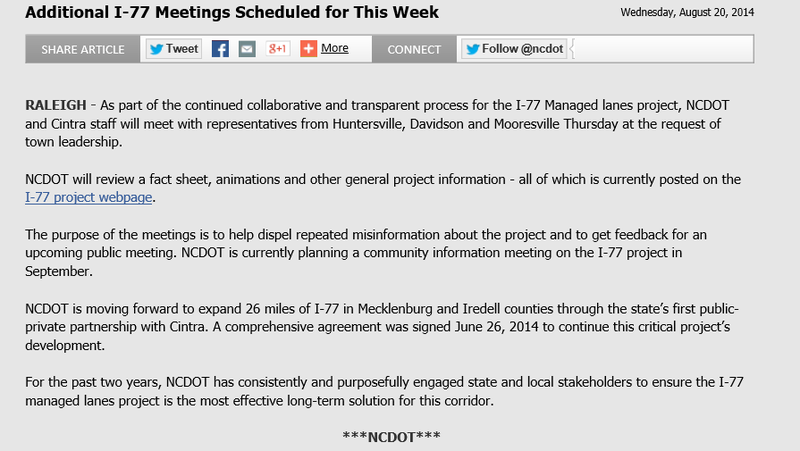 DavidsonNews.net is reporting that the NCDOT "did not intend for the meetings to be closed." Based on the correspondence we've received here, that statement is simply not credible. We have verification from officials from multiple towns involved that these were supposed to be closed and that the method for keeping them closed was a deliberate attempt to avoid open meetings law. However, if this wasn't the doing of NCDOT there is another possibility. It is possible that the intent to keep these meetings closed was being driven locally and not by from the State level. Remember this post about the lengths our local mayors would go to protect this project - North Meck Mayors + Speaker Thom Tillis (aka The HOT Lanes Bucket Brigade)? Who really requested these meetings be closed? That's something worth looking into. Update: DavidsonNews.net is now reporting that when confronted with citizens and reporters, NCDOT caved and opened up the meetings after asking the electeds present. NCDOT apparently now claims they never intended to have these be "closed" - a claim that is simply not credible after seeing correspondence from local officials involved. Chalk this up as a small victory for open government! Thanks go out to CarolinaPlottHound.com for posting this story from aShortChronicle and making it the fastest rising post in our site's history. We work here to have an impact on transparency in local government. If that work had anything to do with this outcome, it is something we are more than happy to continue doing. aShortChronicle has learned of "private meetings" scheduled between LKN town officials, NCDOT, and I77 HOT Lanes contractor, Cintra. These meetings will occur tomorrow, Thursday 8/21, in Mooresville (10am) , Davidson (1pm) and Huntersville (3pm). Davidson Public Information Officer, Christina Shaul, confirmed that these meetings were set at the request of NCDOT, and they will be closed to the public. She also indicated that town officials are working to schedule some more open meetings on the subject. The Thursday meetings appear to be deliberately coordinated to avoid State open meeting requirements by limiting the number of elected officials from each town at each meeting. This avoids any of the elected boards from having a quorum at any one meeting - something that would require them to be open to the public and the press. As of this writing, there is nothing on the Town of Davidson website announcing these meetings will even occur. This tactic has become an unfortunate pattern on a project plagued by poor communication with the public. It was first used last year when the project was in earlier stages. Now, for some reason it is being used after the "sale" has supposedly been made. Why? It also raises questions about who is in charge here. Who makes the real decisions about how our public discourse will be conducted? Are our elected officials running things, or are the unelected bureaucrats at NCDOT? It would appear to be the bureaucrats. We've previously and repeatedly been told that Cintra will eventually hold public hearings on toll rates. Of course, that will only happen once it is too late to turn back. In the meantime the public will continue to be treated like mushrooms - kept in the dark and fed only fully digested compost. Bonus Observation: Not all of our region's officials believe keeping these things hush-hush is the right thing to do or in the public interest. If they did, this information would not have come out. Now that it is out, will the "real" media do anything about it? We here at aShortChronicle are not holding our breath. That's not to say WidenI77.org supporters weren't there in force. They were. It's also not to say they didn't ask hard and informed questions. They did. What was a bit unexpected was how Commissioner Fuller responded, or more accurately - preempted the questions. As Commissioner Fuller was giving his opening remarks he worked in that the counties have little to no responsibility for roads in North Carolina, and more specifically on the I77 HOT Lanes project he said that he "knows almost nothing about it." He even went as far as to say it would be improper for a County Commissioner to comment much on roads because they were the responsibility of other elected bodies. A wily response from a wily politician. I guess the Iredell County Board didn't get the memo though. Back in January 2013 when the debate over HOT Lanes really began to rage, they showed the courage to step into the fray rather than hide from it. Mayor Woods will likely open the meeting with an insistence that questions be limited to only those regarding "county business" as was mentioned in the town's public notice for the meeting. (HOT Lanes on I77 will conveniently not be considered "county business".) Expect repeated attempts to avoid and shut down discussion on this topic. 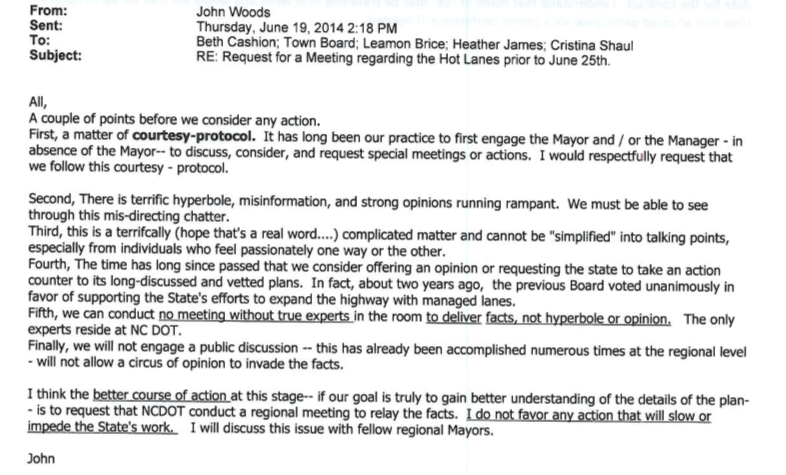 If the topic is broached, there is also a 90% chance that the word "misinformation" will be used by Mayor Woods at some point during the meeting with slightly lesser chances of "hyperbole" and "hysteria". In the event HOT Lanes opponents are allowed to ask a single question, there is a 100% chance of heavy duty eye rolling from Davidson Commissioners Jenest and Graham. This concludes this message from your local emergency broadcast system. 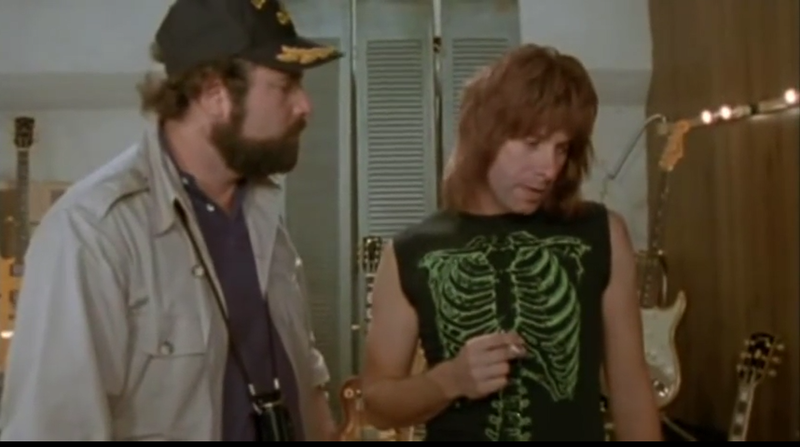 HOT Lanes Meets Spinal Tap..."these go to eleven?!?!" Click for Video if the reference escapes you. Davidson's Town Board met with LNTC and NCDOT officials last week to discuss HOT Lanes in a special meeting. See DavidsonNews.net for the whole story. It's commendable that this meeting occurred though it would have been much, much better if it had been allowed before the contract was signed for commercial close of the project. 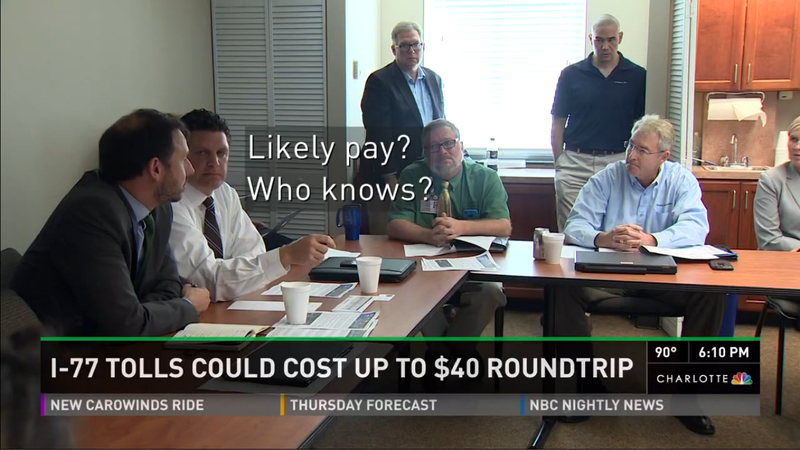 Davidson Mayor, John Woods, squashed that from happening back in June saying the "only experts reside at NCDOT", so a meeting could not be had without them present. With these "transportation experts" in the room, Davidson's Board got an in-depth briefing that appears to have given very little new information. Davidson will get a new bridge over I77 wide enough to accommodate bike lanes. That was known already. In fact, this is already incorporated in the Exit 30 small area plan updated last year. Readers can decide for themselves if 50 years of tolls is a reasonable price to pay for 2 bike lanes. Davidson still does not have an access point to the new HOT Lanes that is convenient for the town. That was known as well when the Cintra proposal was initially released. Why this was not fought for by the previous Davidson Board as a requirement for town support for the project is maybe the bigger question, but it is nice to know that the town will be pursuing it now - if it's not too late. Commuters still don't know how much it will cost to use the HOT Lanes, but we are once again assured that there will be public hearings. But there will be public hearings. But there will be public hearings. People want real answers now, not promises of some future action that might give them those answers later - after it's too late to turn back.